I love salads for lunch, but as the weather gets chillier, I find that my usual mix of greens and grilled chicken just doesn't satisfy the way it does in the summer. 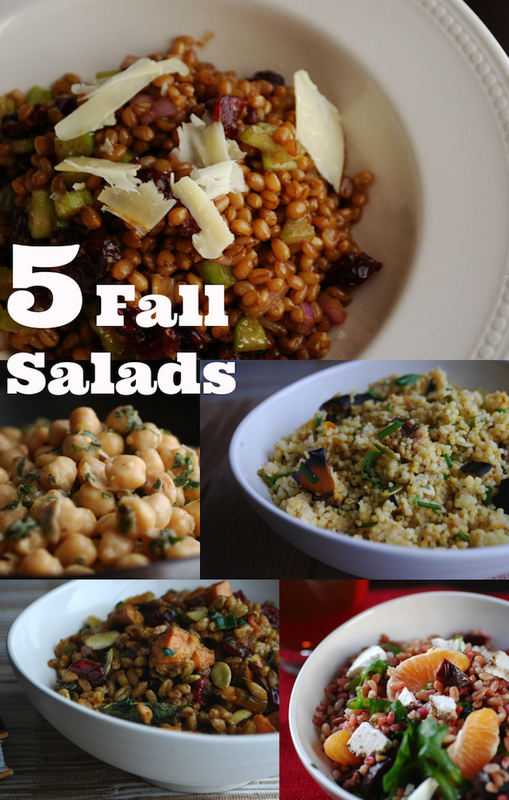 Here are a few of my favorite hearty salads--rich with whole grains, roasted vegetables, and warm flavors that make them perfect for Fall and Winter lunches. Hearty wheatberries tossed with a mix of fresh herbs, dried cranberries, salty cheese, and a tangy balsamic vinaigrette. All the flavors of hummus, in salad form! Super high in protein and rich with flavor. Make this one in advance and enjoy it all week! Warm curry flavors are fantastic when paired with sweet maple roasted acorn squash. This one is just as good warm as it is cold. One of my absolute favorites. Delicately spiced farro is tossed with roasted sweet potatoes, dried fruit, and handfuls of toasted nuts and seeds. I love this combination of sweet and tangy flavors. Use your favorite citrus and pair with chewy whole grain farro, roasted beets, goat cheese, and a bit of arugula for added freshness.